In the construction industry currently, a iPhone and a iPad are critical when going to a job site (for pictures and note taking RFI's), those that use Apple devices get the job done faster and on time, and it's the combination of fast hardware and software nothing else comes close. So wait until the current model is no longer being produced and grab it at a discount is what you are saying? You have price limit others may not have that same limit. That doesn’t mean that the iPad Pro is not worth what Apple is asking. Which is how it seems you feel when you mention spending the difference on your loved ones? Honestly this logic can can be applied to almost any purchase. It will always be cheaper if you wait. As a contractor I work across sectors. In oil & gas we used a tablet app to view 3D schematics of ocean rigs, and inspectors could make virtual notes on various pieces of equipment as they walked the rig. But that’s not real work? It’s not consumption, it’s not art/drawing. It’s work. That ergonomics of the keyboard accessory limit usability isn't stopping me from purchase today, but as I have a first generation iPad Pro 12.9, I'm willing to wait for iOS 13 and presumed support of attached drives, and the release of the pro apps like Photoshop that are on the way. I did get to the Apple store and tried the attached keyboard for the new iPad Pro 12.9, and found the keyboard action surprisingly improved, in my opinion, over the one I purchased for my current 12.9. Adding a touchpad and necessary UI and API for that would go far to create a notebook analog with the iPad Pro. One thing that I would like to see is a future feature where I could "stream" still images from the buffer in my DSLR/MILC camera directly to the iPad Pro (or an iPhone for that matter) as I shoot, which would definitely be a challenge of WiFi peer to peer bandwidth, even given the deep buffers of current cameras. The fallback would be to stream out of attached storage, in my case an XQD or SD card. I would prefer that this happen in a screen off mode in my backpack, possibly controlled from an Apple Watch or iPhone, such that I needn't physically access that iPad at all while shooting images. That would definitely give me benefit of a 1 TB storage capability. Yes, I agree that it depends on the work demands. 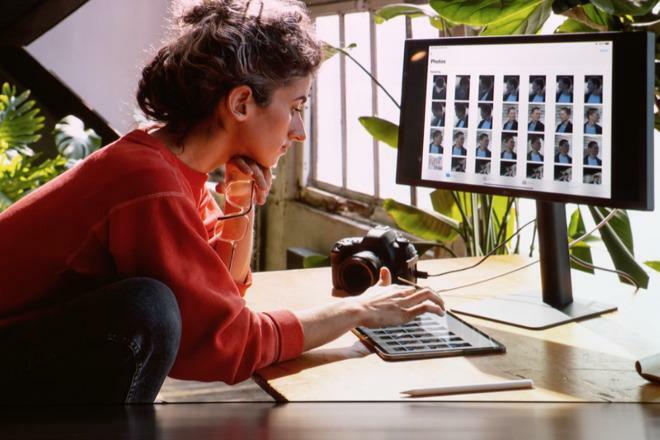 But, without evidence other than my own experience, I think most "pros" are doing the traditional laptop tasks that he references -- rather than, say, photo editing. So, I would agree with him based on the functional needs of "most" professionals". I think part of the difficulty lies in Apple's use of the word "Pro". In fact, many pros don't have a need for the highest performance machine. While the needs of many amateurs far exceed those of a pro. I'm not recommending dropping the "pro" monicker, just recognizing that functional requirements have little to do with whether or not one is generating money from them. I’m not sure why the comparison between iPads and laptops is always one-way in favor of the laptop. There are a lot of things my iPad does better than my laptop. For example, my iPad Pro is my favorite way to take notes. Goodnotes and the Apple Pencil are an amazing combination. I love making graphs and flowcharts in Grafio using the Apple Pencil. And I do a lot of PowerPoint presentations directly from my iPad. (Though I wish MS would bring feature parity to the animation controls for the iOS version.) And, again, I can markup changes to the deck with my Apple Pencil. The iPad also makes for a great portable photo editing platform. Using Canon’s Connect app I tether my DSLR wirelessly to my iPad to control my photo shoots and preview on the fly. The iPad can do all of these things while being lightweight, easy to carry around and use, and with all-day battery life. I am really stunned at how great the battery life is in the new iPad Pro 11”. I can use from 8 AM in the morning to late in the evening without having to charge it. The new pencil seems to be a great improvement. The charging setup for the old pencil was incredibly unwieldy - I’m always afraid I’m going to knock it and break off the connector. Having an 8” pencil sticking straight out of the bottom/side of your ipad is a surprisingly un-apple setup. The new design is safer, easier to keep the pencil handy, easier to keep it charged and better all around. I just wish they would have let people use the old pencil with the new ipad, but that’s unlikely to be an issue for me. The idea that a single device has to take over your entire workflow in order to be considered "professional" is a fallacy. For example, how many cameras does a professional photographer own? It's not going to be a single device. I’m currently using the 10.5 iPad Pro, just waiting for availing in my country to get the 11. As far as iPad v laptop goes, the iPad is used 90% of the time. The Macbook is only around because there isn’t an Indesign alternative for iOS atm. Attaching a keyboard to an iPad is a compromise on portability and ease of use, as well as on battery. The iPad is designed to be used without attached keyboard and I am writing this on an iPad laying flat on the table. It is not different than typing on a hardware keyboard. That keyboard/trackpad/mouse/macOS issue was resolved years ago with 12” Macbook, which provides the power of macOS in an iPad footprint/portability. Apple releases clearly defined, complete and consistent products, not toaster/fridges. I’ll just put my 2¢ in to say I don’t believe in using the term “Pro” for anything because it’s too open for interpretation, too indeterminate. Just as any shade tree mechanic can hang out their shingle and call themselves an automobile repair shop too many in the tech, especially the tech blog world, fancy themselves “professionals” when in reality they are just tinkerers. And one “Pro’s” needs and wants can vary greatly from person to person. Claiming to be a “Pro” also inflate one’s influence and credibility where it might otherwise not be credible at all. That’s the thing about the anonymous Internet. You CAN’T believe anything your read. "Attaching a keyboard to an iPad is a compromise on portability and ease of use, as well as on battery. The iPad is designed to be used without attached keyboard and I am writing this on an iPad laying flat on the table." You may be right but to do that for long periods of time while looking down at the tablet ends up being a strain on your neck. People have been looking down at things flat on a table for centuries, reading books, writing and drawing on paper, cooking and who knows what else activities. It’s no more a problem then any other activity vis-a-vis repetitive stress injuries. I've been wondering if the Marzipan project, which is described as allowing developers to bring iOS apps to the Mac, isn't also a strategy for bringing a pointing device to iOS. When they bring pointing device support to UIKit, it should work on iOS just as easily as macOS. I'd be very surprised if they don't do this. The questions is when. I’ll check it again the next chance I get. Of the four 2018 iPad Pros I saw, two of them had their Pencils loosely hanging from them. So, perhaps they were sticking on with one magnet, ie, the Pencil was two far up the side and was hanging on with the opposable magnets. Or Apple doubles down and brings a touch screen to the Mac. At this point I wouldn’t be surprised, given how conflicting their positions are. They claim a Mac can’t have a touch screen because it would be hard to use requiring a user to lift their hands off the keyboard in an unnatural position to select items, while they market an iPad with a keyboard that requires the user to do exactly that. 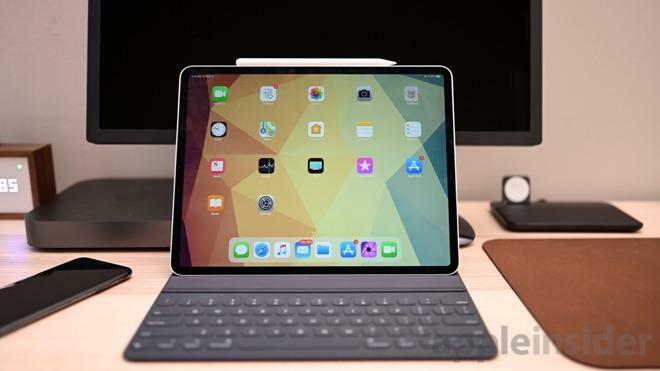 And at the same time, they say the iPad can’t have a mouse or trackpad because it’s easier to touch the screen and use a pencil, despite marketing it for use with a keyboard, removing their fingers from the screen. So it all depends on how Apple plans to reconcile this disparity. Only allowing iOS apps to run on Macs that support touch screen displays encourages customers who want to run them to upgrade their Macs. Adding a mouse to an iPad is a much less profitable path.